I wrote last week about Christmas presents; perhaps I 'opened' them for you a week too early! When I was looking in the old photo album for that picture of my brother and I with our presents, I ran across another one from about the same era, also Christmas related. It shows quite a heart-warming scene - 'Daddy' is in his dressing gown reading to his children, his little daughter on his knee, the two boys sitting beside him. 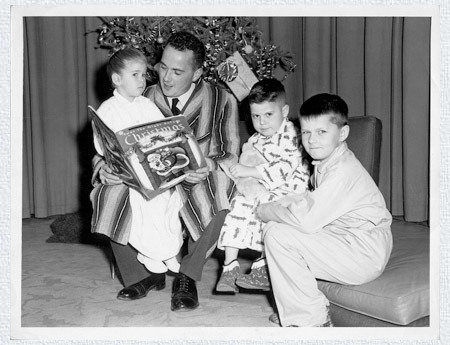 The book is that classic Christmas chestnut, "Twas the Night Before Christmas." Little girl ... two young boys ... Daddy ... this must be our family right? Well, no. I am indeed in this picture - one of the boys - but that is not my family. The photo was taken during the filming of a television program; this was my very first appearance on TV - and in my pajamas yet! My father was at this time a member of one of the bands in the Canadian Air Force, and playing Christmas concerts was part and parcel of their job description, which was a combination of providing music for military affairs (parades, etc. ), and general public relations. They must have been asked to do a Christmas concert on television, and this little poetry-reading set piece was presumably devised as an interlude between musical numbers. I guess a few of the band members were told to bring children along, and I was one of those chosen. It would be dishonest of me to pretend that I can remember this episode clearly. I think I have a vague remembrance of being a bit embarrassed by having to appear on live television in my pajamas, but I'm smiling eagerly in the photo, so I guess I can't have been all that upset by it! And I do remember some of the music that they played, one piece in particular, a composition called 'Sleigh Ride'. Some years later, when I myself was playing in bands - at school and in our community - this same piece was always part of the Christmas concerts we played, so it became even further embedded into my memory. But after I left the music world, and took up printmaking, there was no reason for me to remember it again. Until one day ... at Shinobazu Pond, in Ueno Park. It was on my very first trip to Japan; it was wintertime, and I was wandering around Tokyo looking at all the 'sights'. Everything seemed so different from what I was used to: all the signs were in unreadable characters, the voices around me were speaking a language I couldn't understand, and the food in the restaurants was all strange (although interesting!). It was mid-December, but - unlike Japan in December these days! - there was really nothing around that showed that Christmas was approaching. As I walked along the pathway around Shinobazu Pond though, and approached the little restaurant that sits just at the entranceway to the little island with the temple to Benten-sama, I heard the music that they were broadcasting from speakers placed outside, to try and attract customers. Yes, it was that same Sleigh Ride, and in the same concert band arrangement. I sat on one of the benches, and enjoyed the contradictory mental images ... the little boy in pajamas in a television studio in Canada all those years ago, and a park bench overlooking a temple in the centre of Tokyo ... connected by the memory of a piece of music. I wonder in what distant location I'll hear it next ... on my first trip to a moon hotel, perhaps!